Clinical Question: What would you do if you have a patient with cellulitis, but you are still worried about an underlying septic joint?? At Grady, the Orthopedic service would like an ESR, CRP, Gram stain and culture, along with a sample of the synovial fluid for them to view after the joint is tapped when evaluating for septic arthritis. If you have an overlying cellulitis but are still concerned for a septic joint, what do you do? Lenski, Markus, and Michael A. Scherer. “Analysis of Synovial Inflammatory Markers to Differ Infectious from Gouty Arthritis.” Clinical Biochemistry 47.1-2 (2014): 49-55. Web. Margaretten, M. E., J. Kohlwes, D. Moore, and S. Bent. 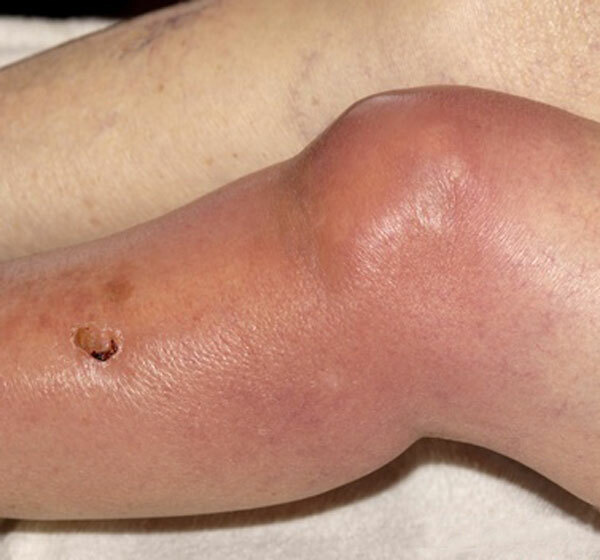 “Does This Adult Patient Have Septic Arthritis?” JAMA: The Journal of the American Medical Association 297.13 (2007): 1478-488. Web. Carpenter, Christopher R., Jeremiah D. Schuur, Worth W. Everett, and Jesse M. Pines. “Evidence-based Diagnostics: Adult Septic Arthritis.”Academic Emergency Medicine 18.8 (2011): 781-96. Web. Li, S. F., C. Cassidy, C. Chang, S. Gharib, and J. Torres. “Diagnostic Utility of Laboratory Tests in Septic Arthritis.” Emergency Medicine Journal24.2 (2007): 75-77. Web.